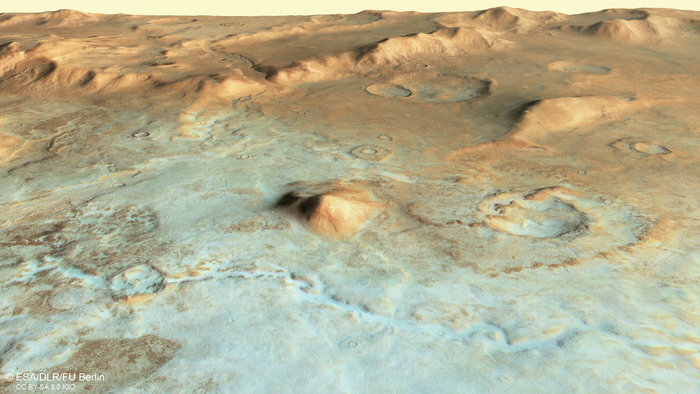 Nestled within the fractured rim of a vast impact basin on Mars are valley floors dusted in frost. 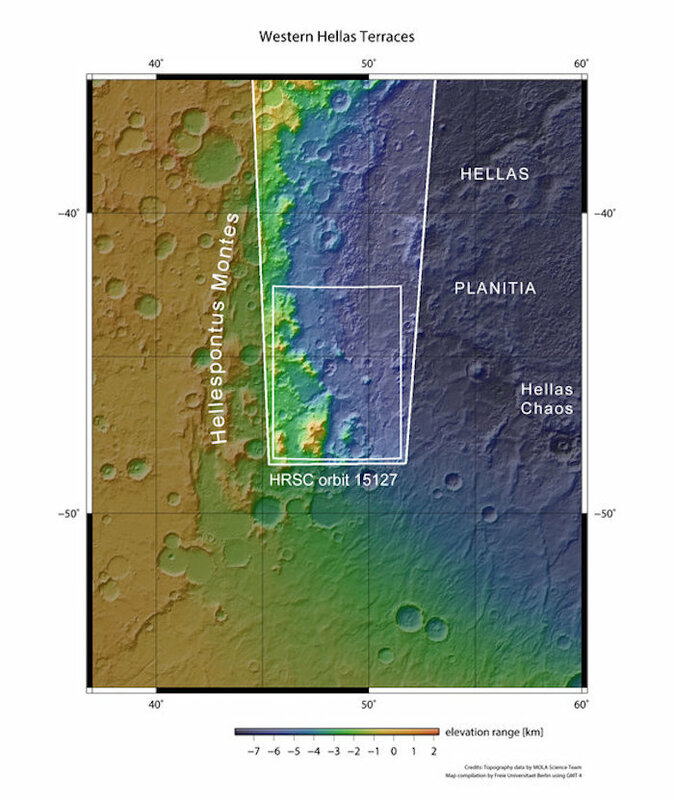 At 2200 km wide and up to 9 km deep, the Hellas Basin is the largest impact crater on Mars. This scene, captured on 6 December 2015 by ESA’s Mars Express, focuses on a portion of the western rim of the basin. This region spans a height difference of over 6000 m, stepping down like a staircase from the basin’s fractured, terraced rim to its flat, low-lying floor that is covered in frost or ice. 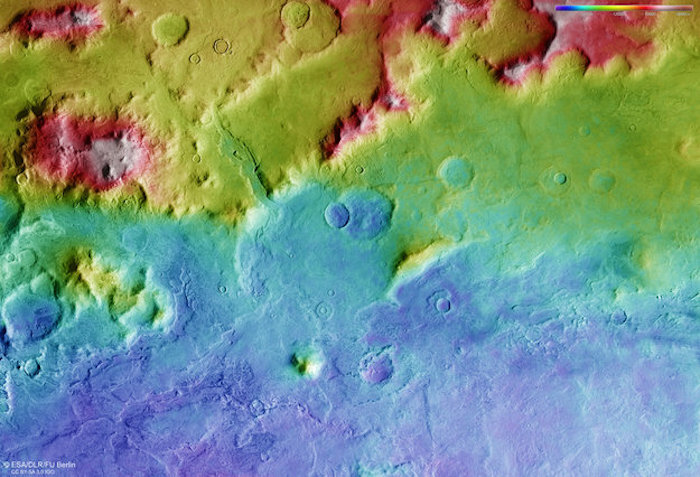 The surface expression of numerous valley-like features can be seen below the icy covering, indicating a flow of material towards the catchment areas on the floor of Hellas. For example, towards the centre of the image, a glacier-like flow has carved a valley through the terraced topography, transporting and dumping material into the basin in a fan structure. Zooming into the channel reveals parallel structures on the surface – ‘lineated valley fill’– that point to the flow of material. Mass-movement of material can be seen all over the scene. 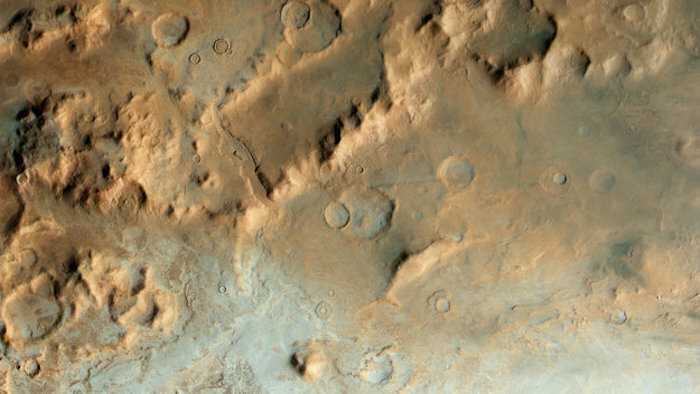 Another example can be found in the small impact crater to the far left of the main image: its rim has been breached, and material has cascaded downhill. Elsewhere, numerous gullies can be seen etched all along the terraced slopes. 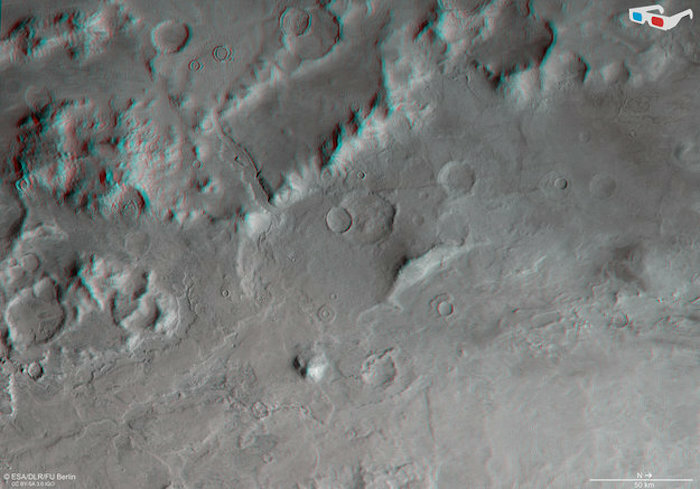 Towards the centre-right of the main images are neighbouring impact craters that have been cross-cut by a fault, creating a small step in the terrain that can be best seen in the 3D anaglyph image. The fault must be younger than the crater that it cuts through, implying that this region could have been subject to later periods of faulting due to subsidence of the terraces.